A comprehensive book involving 26 years of research and study by the present Rector of the Sanctuary of Saint Philomena in Italy and Custodian of the Sacred Body of St Philomena, Monsignor Giovanni Braschi. Who has dedicated his priesthood to this most Powerful Saint in Heaven. Msgr. Giovanni finally finished his new book 2010 in Italian, “Saint Philomena, Testimony of the Light of Christ”. It has now been translated into English, French and Spanish. The English edition was published August 2011. 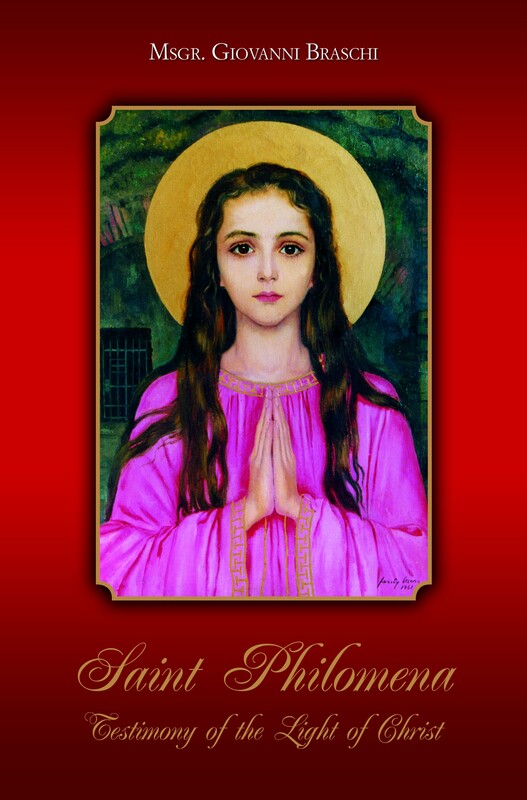 This is the most comprehensive book about St Philomena, each fact well researched and accurate. It is not only a pleasure to read but also an inspiring story of a wonderworking Saint. 2011, a poem, "Star of Heaven" by Giuseppe Boccia, influenced him to write yet another book, only available in Italian, with this title. The "pastoral" meaning of the book is what guided its author Monsignor Braschi. "I hope that my effort for the goodness of the devotees, and for the sake of truth, may strengthen and spread the love and the devotion for our little, great and splendid Martyr!" "In drafting this book - written for the glory and honor of Saint Philomena, and with the intention of re-establishing internationally the veneration and devotion for the Saint – I have chosen the main bibliographical sources and the most significant contributions from the world of literature, science and art: I thank you all fervently." The Miracle of the Curé of Ars. Between Saint Philomena and the Curé of Ars, an important relationship was established. This relationship is so important that the figure of the Curé of Ars becomes incomprehensible if his huge devotion to his dear “little Saint” is not taken into consideration. This bond has something of the prodigious about it. Saint Philomena’s Miracle towards the Curé of Ars was multiform; 1) Saint Philomena’s apparition to the Curé of Ars; 2) Miraculous healing of the Curé by Saint Philomena’s intercession; and 3) Miraculous healings happening in Ars following the Curé’s urging everyone to turn to Saint Philomena. "Struck by violent illness, Jaricot, paralytic and nearly dying, came on pilgrimage to the Sanctuary of Mugnano, where she arrived on August 8, 1835, brought on a chair (this chair remains in the Sanctuary museum to this day). According to some witnesses she already looked like a corpse. She remained for two days in prayer in front of the urn of Saint Philomena. On August 10th, during the blessing with the Most Holy Sacrament, she had the sensation of having been healed; she got up and walked without any support. This is how the Servant of God describes the event;"
"For many years I had been affected by various illnesses, so serious, that I had no hope of healing, this established by a consultation of the doctors of Lyon, who asserted that the resurrection of the dead would have been a miracle of the Most High, and my health, for the incurable illnesses, required more miracles, and big ones." "But what scared me most of all, and made me tremble every moment with the possibility of imminent death, was an aneurysm of the heart, with which I had suffered for many years.........."